Metronome beats are a must for keeping perfect timing in a musical performance. 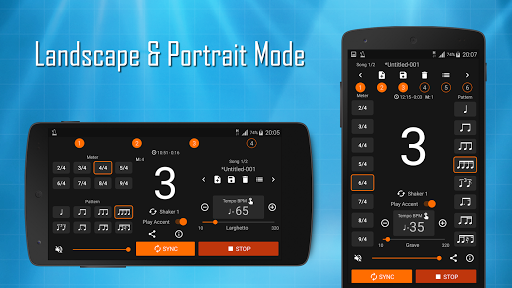 The Stage Metronome free app is developed by the musicians - for the musicians. We understand what is needed in a metronome that is useful for a band or individual during practice and on stage during a LIVE show. 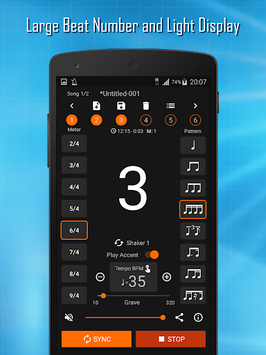 This simple metronome App is designed mainly for on-stage use during LIVE performances. Easy to access buttons for configuring Meter and Beat-Patterns make this Stage Metronome app it easy to use. Big beat-number display can be followed from distance during the performance. The SYNC button is useful to reset beat of an ongoing session. The beat number area can also be used as the Sync button. Song specific information can be saved for quick retrieval of song specific detail. Tempo can be set quickly and easily by tapping on the tempo area. ★ Background Modes – works in background when another app is opened. ★ Easy song management – save and load your favorite song settings, arrange songs differently for different performance sessions. This app maintains perfect timing as long is the actual device supports it. That means, the device can play a 120 BPM metronome audio file (e.g. mp3 format) perfectly with proper timing.